Bordering on the Crazy. Most of us think of borders as straight lines. Perhaps another line meets them, bringing three entities together. Sometimes it is a form of a +, bringing four entities together. Sometimes it is even weirder than that. This article explores 11 different international border oddities, including multiple levels of enclaves (enclosed countries) and divided villages. Art on or In The Road. Canadian artist Roadsworth likes to take existing street and sign markings and turn them into street art. Literally. I find them quite cute, but I wonder if people notice them. Las Vegas Remembers. Las Vegas may not be keen on keeping the past (as the hotels go boom! ), but it is keen on remembering it. It does this by…. naming streets. You’re familiar with the dead hotels memorialized in street names: Sands, Dunes, Riviera, Sahara, Tropicana (oh, right, that’s not dead yet). It also does it for start associating city — most recently, when it renamed a stretch of Riviera as Elvis Presley Blvd. Elvis Presley Boulevard, formerly Riviera Boulevard, is four-tenths of a mile and runs from the Strip to Paradise Road near the Convention Center and the Westgate. Other streets named after celebrities include Frank Sinatra, Dean Martin and Sammy Davis Jr. drives, all of which meet behind the Mirage. Jerry Lewis Way can be found south of that intersection, also intersecting Dean Martin Drive. Not far from there is Mel Torme Way, off of Spring Mountain Road near Fashion Show. Tony Bennett Way runs east of Paradise in between Twain and Flamingo. Debbie Reynolds Drive is near Convention Center Drive, and Hugh Hefner Drive is just off of Flamingo Road. UNLV’s most famous basketball coach has Jerry Tarkanian Way in the southwest along the 215 Beltway. Wayne Newton Boulevard is near McCarran International Airport. You get the idea. Belugas in the Air. Airbus has released photos of the Airbus Beluga XL. This plane, a modified A330, is used to fly aircraft components across Europe for manufacturing. Some think it is pretty. It reminds me of a Pontiac Aztek. The Speed of Sound. A bit faster than the Beluga is the Supersonic Jet designed by Industrial Engineer Charles Bombardier. The Paradoxal resembles a stingray, and would not be suitable for autonomous operations. But it would go fast, being outfitted with two rim-rotor rotary ramjet engines that would give it enough power to climb to 60,000 feet and reach Mach 3. At that point, the air-breathing engines would transform into rocket engines by injecting liquid oxygen injected into the gas exhaust port, placing it on a parabolic suborbital path with an apex of 65 kilometers (approximately 40 miles)—a cruising level well above the stratosphere. The plane would be made of standard civil aviation materials using current aircraft manufacturing techniques, and would be compatible with all existing airport infrastructure and services. However…. a few of its mechanisms have yet to be developed: for starters, the proposed R4E engines, though they could be replaced with existing turbines that use afterburners to increase thrust. Bye Bye 747. United Airlines has announced that it will be pulling its last 747 out of service this year. The 747 was a revolutionary plane when it was introduced in 1969, but its four engine design makes it a gas guzzler in an era where both fuel consumption and exhaust output must be minimized. Further, the economics are increasingly not there — profits are easier on an appropriately outfitted A330 or 767, and if you need BIG, there’s always the A380 or the 787. The 747 remains a cargo workhorse, given how much it can hold. Thrift Shop Finds. This article was the real impetus for this post: Someone who shops regularly at Thrift Shops — because that’s what she can afford — talks about what are the best things to donate. At this time of year, Thrift Shops can be a god-send for the less fortunate among us. I regularly donate to thrift shops (in particular, the National Council of Jewish Women, which will send you an itemized list of donations with prices — which my accountant loves). PS: I will not donate to the Salvation Army; they apparently target Jews for proselytizing. Lost Casino Tickets. Gone are the days when the quarters would plunk and plink out of a slot machine in Vegas. Now you get tickets. Have you ever wondered what happens when you lose or do not redeem a ticket? Where does that money go? Wonder no longer: some goes to the State of Nevada General Fund, and some goes to the Casino. Have you lost one? The casino will help you redeem it anyway. Lost Ships. If you didn’t know, much of the financial district of San Francisco is built upon the remains of fishing ships. The podcast 99% Invisible even did a whole episode on the subject. Would you like to find a ship? Here’s a map to the lost ships underneath San Francisco. Found Love. Recently, I read a wonderful post about a long time friend who had a bad year, but found a new love and seems to be having things go better. Let’s all wish Spaf the happiest of his new beginnings. 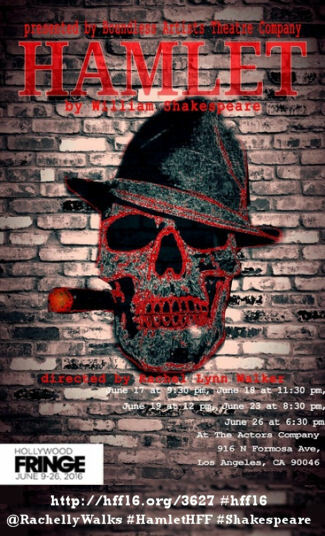 Hamlet is set in the 1940s of Las Vegas and the Royal Family is the mob. Having a struggling desert town working its way towards greatness as a parallel for the turmoil that Denmark was going through connects modern audiences to a time they never experienced before. With a script cut to emphasize the story’s moral and original language to emphasize the depth of the story, this retelling of a classic will wow audiences. Reading this, I thought: “Wow! Ever since I saw the Four Clowns presents Hamlet, I’ve been wanting to see another take on Hamlet. Plus, I’m a student of the history of Las Vegas (especially the mob era in Vegas), and this blend sounds fascinating. I’m in”. So we booked our tickets, and last night we worked our way to West Hollywood for our last show of the Fringe Festival: Hamlet, from the Boundless Artists Theatre Company/FB. Alas, the description was better than the execution. This is not to say that the performance was bad — it wasn’t (although it had some problems). Rather, it simply didn’t match the expectation created from the catalog description. Let’s analyze why, and what could have been done to fix it. Let’s start with that first line: “Hamlet is set in the 1940s of Las Vegas and the Royal Family is the mob.” Great, great idea. So we walk into the theatre, and it is a black box with no set, no projections. The only intimation that we are dealing with the mob is that everyone is in black suits and dark shirts and carry guns, and the ladies are in heels with black hose. Yup. Damon Runyon (think “Guys and Dolls”) mobsters. That’s it. The language still refers to Kings and Queens and Princes and Denmark and France, but with a light New York accent. That’s all that gives us the sense of place. Doesn’t work. Nothing in this execution said “Vegas” at all. So, what could they have done? First, move it up about 8-10 years. In the early 40s, the only resorts on the strip were El Rancho Vegas and The Last Frontier, both started before the war and both without heavy mob involvement. The Flamingo opened in 1946, and the era that is desired is the 10 year era after that, probably best between 1954 and 1956 when you had a number of mob-owned “union pension fund funded” resorts opening. 1954 is particularly good: you’ve got the El Rancho, Last Frontier, Flamingo, Sahara, Sands, Desert Inn, and Thunderbird operating. Go to 1958 and you can add about 5 more, including the Stardust and Riviera. Make Claude (Claudius) the general manager of the hotel, who bumped off the previous general manager and married his wife, Gertrude. Hamlet could remain Gertrude’s son, and perhaps be something like the Casino Director who doesn’t like the situation, perhaps because Claude was the general manager at a competing resort (and, yes, this happened at the time — look up folks like Gus Greenbaum, who was brought in to manage the Riviera in 1955, after successfully managing the Flamingo Hotel after the death (some would say mob hit) of Bugsy Siegel. In December 1958, Greenbaum and his wife were murdered in their Phoenix, Arizona home, reportedly on the orders of either Meyer Lansky or Tony Accardo. Make the other characters have similar changes: Ophelia as Hamlet’s girlfriend who works in the hotel; Laertes in another position and connected to his father, Polonius, who perhaps works with one of the union pension funds. The key point is that if you are going to set it in Vegas and the mob-controlled strip, you have to adjust the story to that context and mileau. Tweak the characters and names. As this is Fringe, use projections to establish the places: the hotel, offices, on the casino floor, in the desert burying a body. Make the costumes era appropriate and not caricatures of what you think the era is. The mob Vegas aspect is a wonderful place to set the Hamlet story and to modernize it (doing so could be a great start at a fun screenplay). However, the execution of this version just failed miserably on that count. It was less visible than the Royal Nevada. The director, Rachel Lynn Walker (FB), who was also responsible for the adaptation and adjustments, needed to study and understand the era before attempting to do this. Independent of screwing up the theme, how was this production as Hamlet itself? What would Billy Shakespeare think? By the way, if you aren’t familiar with Hamlet, either read the Wikipedia entry, the sparknotes, or the play itself. On this aspect, the show was a bit better, but was still flawed (but see the note at the end). The adaptation did a lot of work to preserve the key lines that everyone expects from Hamlet. That was the good part. The bad part was that many of the actors spoke their lines far too fast, and without clear enunciation, which made it difficult for the audience to follow the story (which is already difficult given the unfamiliarity with Shakespeare’s language and language patterns). This was evidence from the moment when Bernardo steps on the stage and speaks his first lines (the actor playing Bernardo was one of the worst — but far from the only — offender). This problem I blame squarely on the director, Rachel Lynn Walker (FB), who has the responsibility to guide her actors to ensure they can be heard and understood by the audience. I have to tell technical students this all the time: slow down and speak clearly. This is certainly true for actors, who must add projection on top of that (and is doubly true when you are adding an accent). So, we set aside the theme, and we set aside hearing many of the actors, and what do we have left? The performances. I’m pleased here to say there were some strong performances that offset the weak and worked to carry the story. We’ll do it in the usual tiers, with highlights. At the time, of course, there is Evan Garcia (FB)’s Hamlet. For the most part, Garcia spoke clear but perhaps a little fast, and captured the emotions well (although he might need to a bit of work to convey the madness of Hamlet a little better). He also didn’t appear to have the strong connection required with Cynthia Asmar/FB‘s Ophelia, who is supposedly his love. Asmar’s Ophelia was fun to watch — kudos for casting diverse body shapes — and handled most of her lines well. As the King and Queen, Richard Lozoya (FB) and Lauren Sanatra (FB), respectively, performed reasonably well. My wife thought Lozoya spoke a little fast; I thought he was OK. More importantly, other than the words there was nothing to convey a good sense of what the relationship was between Hamlet and these folks, and why he cared about them at all. Polonius was played by Sergio Venegas (FB), and he had one of the best performances of the team. He spoke clear and loud, and did a great job of conveying his meaning. Shannon Walker (FB)’s Horatio worked well sometimes and at other times spoke too fast. In any case, she performed well and was fun to watch. However, there were a few points where it was clear she was struggling on the next line; by the 5th Fringe show that problem should have gone away. Her partner-in-crime, Daniel Verdugo/FB‘s Bernardo, was more of a problem. He always spoke too fast and too softly, and it was often difficult to figure out what he was saying or doing. Rounding out the cast were Andrew Cercedes (FB) as Guildenstern, Joy Ann-Marie Horn/FB as Rosencranz, and Ryan Jones/FB as the ghost. Rosencranz and Guildenstern needed to work on their projection and slow down a bit more. Turning to the production side again, there was no credit provided for set design, because there was no set. Costume and Prop design was by the director, Rachel Lynn Walker (FB), and here again there were some distracting fails. My wife noted that the shoes were wrong for the era. At one point Joy Ann-Marie Horn/FB was an a dress with a large opening in the back, and a bra strap was clearly visible. This did not fit the era in question — either the 1940s or 1950s. In the final scenes, Shannon Walker (FB) needs to watch out as she was about falling out of her top when she was leaning forward. Again — that’s a costuming problem that should have been caught by the director. Actors seemingly kept dropping their props, and the variety of guns was off. On the plus side, the fight and dance choreography by Richard Lozoya (FB) was quite good. No credit was provided for stage management or lighting design. Justin Huen operated the board, and the production was presented by the Boundless Artists Theatre Company/FB. Note: Writing this up uncovered the fact that most of the actors, as well as the director, of this production are relatively new to the industry. I do not want this writeup to seem harsher than it should — they were very good for their skill level. The problem is: the audience (especially an audience at Fringe) doesn’t know the actor’s skill level. As a result, the actors and production team need to up their game. There are things one overlooks because it is Fringe: fancy sets, fancy costumes, lots of rehearsal time in the space. But other things are space independent: learning to speak at a speed where the audience can understand, speaking with sufficient projection and enunciation to convey the story. Exhibiting emotions and relating is one thing, but what makes something a play over a pantomime is the writing. I encourage these young actors to keep practicing and working at the craft, and hope to see them much improved next year. This is where a skilled director can come in; they can educate and teach while molding and shaping. I fear the director in this case was overextended: not enough time to research for the writing, not enough time to rehearse with the actors, and not enough time to research to get the costumes to convey the message. In any case, this company still has a skill I don’t have — inhabiting another character. I’m just an engineer who knows how to write. We saw the last performance of Hamlet, and it looks like it wasn’t extended for the Fringe Encore Awards. Attention Programmers! Take the Fringe Programming Challenge! Scheduling your shows at the Fringe can be a pain in the …. I’m trying to solve the problem for next year, so take a look at my specs for a Fringe scheduling app. Can you write it? ✓ Sun, 6/12: Titus Andronicus Jr. (700p) (✒); and then the Tony Awards when I get home. Whew. July brings us back to conventional theatre, with Beautiful at the Hollywood Pantages (FB) and the Western Corps Connection (FB) the first weekend, Grey Gardens at the Ahmanson Theatre (FB); the second weekend, The Little Mermaid at Cabrillo Music Theatre (FB); the third weekend, Weird Al Yankovic at the Hollywood Bowl (FB) and Operaworks (FB) Opera Re-Constructed at CSUN; the fourth weekend, a mid-week Hollywood Bowl (FB) concert of Wynton Marsalis and Aaron Copeland, and … currently nothing for the weekend. As of right now, August is completely open. One weekend has a bar mitzvah, and there are a few holds for show, but nothing is booked. Late August may see us looking at shows down San Diego/Escondido for one weekend. The best of the shows available — or at least the most interesting — is Titanic from Moonlight Stages. September is similarly mostly hold dates at this point. As always, I’m keeping my eyes open for interesting productions mentioned on sites such as Bitter-Lemons, and Musicals in LA, as well as productions I see on Goldstar, LA Stage Tix, Plays411 or that are sent to me by publicists or the venues themselves. “Op-Ed: History isn’t a ‘useless’ major. It teaches critical thinking, something America needs plenty more of “. Although perhaps grammatically challenged (ending a sentence with a preposition), a good point is being made: History teaches loads of skills, including the ability to think critically. It also teaches its students to see that simple solutions are often not the right answer; life, like history, is often complicated by a myriad of factors. As the article notes: “A historian, however, would know that it is essential to look beyond such simplistic logic. […] The utility of disciplines that prepare critical thinkers escapes personnel offices, pundits and politicians (some of whom perhaps would prefer that colleges graduate more followers and fewer leaders). But it shouldn’t. Labor markets in the United States and other countries are unstable and unpredictable. In this environment — especially given the expectation of career changes — the most useful degrees are those that can open multiple doors, and those that prepare one to learn rather than do some specific thing.” An op-ed piece well worth reading. PS: If you want to exercise the critical thinking skills of a history major, especially one that knows Yiddish, Jewish Studies, and Native American studies, I know of one looking for work. “Date of First Riviera Tower Implosion Confirmed: June 14“. And more Vegas history goes down into a pile of rubble. The Riviera is one of the last hotels still standing from 1950s Vegas. All that will be left on the strip will be the two-story wings of the Tropicana. Next is Caesars and Circus-Circus, dating to the 1960s. I’m not arguing to save the Riv — that ship has sailed. Rather, this is a recognition that Las Vegas is a town where the past is bulldozed, tilled under, and reborn. Vegas does not create memories that can be revisited; it creates experiences that are lived in the moment. “There’s an Art Deco Airport Lying Ruined in Brooklyn“. Name your New York airports. You probably think JFK, La Guardia, and Newark. How about Floyd Bennett Field, New York’s first airport in Brooklyn. This article is a fascinating exploration of that field, which is still standing. “Long before JFK and LaGuardia, there was Floyd Bennett Field, New York City’s first municipal airport. Designed in stunning Art Deco style, it was once the most modern airport in the world, a glittering gateway into America’s principal metropolis. Many of the leading aviators of their day started daring adventures here during the golden age of aviation—pilots like Amelia Earhart, Charles Lindbergh and Roscoe Turner, the latter of whom flew with a lion cub as his co-pilot. […] But today many of the old hangars lie empty and abandoned. The deserted control tower looks over runways covered in weeds.” Fascinating read; c’mon 99% Invisible, how about a story? “How The FAA Shot Down ‘Uber For Planes’“. The sharing economy. We’ve seen apps for sharing unused space in cars, unused space in houses, and unused spaces at the dinner table. What about that unused seat on a private aircraft? The links in this discussion explore a startup that tried to address that space… and that got shot down when the FAA said it was a common carrier and would need to follow all of the rules of the big boys. Yet another example of the laws not catching up with our technology. “Audio fandom: exploring the ambient noises of stfnal spaceships“. Have you ever watched Star Trek, and thought about the background noise? The Enterprise had a distinct hum (at least in TNG), which was very different than the background noise on DS:9. Those noises come from somewhere, and this article is an explanation of that “where”. It discusses how the sound and art designers come together to create an almost subliminal image statement about the ships. “How a Lost Marx Brothers Musical Found Its Way Back Onstage“. I know, you think I’m talking about the Marx’s interpretation of Chekov’s The Bear, as seen in “A Day in Hollywood, a Night in the Ukraine“. I’m not. There’s another Marx musical — one that has been unseen since the 1920s, when it was the Marx’s first show. This article explores how “I’ll Say She Is” — the first Marx Bros. musical (before Cocoanuts), which has been reconstructed and is about to reopen off-Broadway. “The Long Quest to Find Ashkenaz, the Birthplace of Yiddish“. As I type this, I’m digitizing some Yiddish cassettes for my daughter. Have you ever wondered where Yiddish might have come from? Where the “Ashkenaz” in Ashkenazi comes from? “The place name Ashkenaz occurs three times in the Bible, but by the Middle Ages the exact origin of Ashkenaz was forgotten. Because of the migration of the Ashkenazic Jews it later became associated with Germany. This led to all German Jews being considered “Ashkenazic”, a term which was then applied to central and eastern European Jews who follow Ashkenazic religious customs and who speak Yiddish.” This article attempts to explore that question, and is a very interesting read. “How to Listen to and Delete Everything You’ve Ever Said to Google“. You might not have realized it, but Google records and keeps everything you say: “Every time you do a voice search, Google records it. And if you’re an Android user, every time you say “Ok Google,” the company records that, too. Don’t freak out, though, because Google lets you hear (and delete) these recordings.” This article explains how to do that.